"Vinokourov" redirects here. For the Ukrainian track cyclist, see Andriy Vynokurov. Alexander Nikolayevich Vinokourov (Russian: Александр Николаевич Винокуров; born 16 September 1973) is a Russian Kazakhstani former professional road bicycle racer and current general manager of UCI ProTeam Astana. As a competitor, his achievements include two bronze medals at the World Championships, four stage wins in the Tour de France, four in the Vuelta a España plus the overall title in 2006, two Liège–Bastogne–Liège monuments, one Amstel Gold Race, and most recently, the gold medal at the 2012 London Olympics Men's Road Race. Vinokourov is a past national champion of Kazakhstan, and a dual-medalist at the Summer Olympics. Vinokourov began cycling in 1984 as an 11-year-old, competing within the former Soviet Union. He moved to France in 1997 to finish his amateur career, and then turned professional there in 1998. After almost a decade as a professional, Vinokourov was caught blood doping during the 2007 Tour de France, which triggered the withdrawal of the entire Astana team from that year's race. After a 2-year suspension from competition, he returned to cycling in August 2009, riding first for the national team of Kazakhstan and then for his beloved Astana. A serious crash during the 2011 Tour de France threatened to prematurely end Vinokourov's career for a second time, but he announced he would continue for one more season in 2012 – with an eye towards competing in the Olympic Games in London. There, Vinokourov played the role of ultimate spoiler when he dramatically won the gold medal in the men's road race after breaking-away in the closing miles with Colombian Rigoberto Urán. Vinokourov retired after the Olympics and assumed management duties with Astana for 2013. He is an honorary colonel in the Kazakh army but lives in France with his wife and children. After Kazakhstan declared independence from the Soviet Union on 16 December 1991, Vinokourov continued to train and race, though as a member of the Kazakhstani national team. He placed third behind Pascal Hervé of France in the Regio Tour amateur stage race in Germany in 1993 (Vinokourov later would win this race as a professional in 2004). Other notable performances during these early years include winning two stages at the 1995 Tour of Ecuador and the overall GC at the 1996 Tour of Slovenia. Vinokourov also competed in the 1996 Olympic Games in Atlanta, where he finished 53rd in the men's road race – an event he won 16 years later. In the winter of 1996, Gilles Mas, directeur sportif of the Agrigel-La Creuse team, received a letter from the coach of the Kazakhstani national team, inquiring about the possibility of placing six Kazakhstani cyclists in European professional teams. Mas agreed to take-on the best two, but only on condition they first rode for the amateur Espoir Cycliste Saint-Etienne Loire (ECSEL) clube for a year. Mas and Pierre Rivory of ECSEL chose Andrey Mizurov and Vinokourov. Vinokourov arrived in France on 22 March 1997, after a sub-par performance due to illness in the Tour de Langkawi as a member of Kazakhstan's national team. While he readily adapted to Europe, Mizurov – who had won the inaugural time trial in the 1997 Tour de Langkawi – struggled with homesickness and contemplated a return to Kazakhstan. Ultimately, in May 1997, Mizurov was replaced by Vinokourov's former classmate Andrei Kivilev, who was then racing with an amateur team in Burgos in Spain after having placed 29th in the previous year's Olympic road race. Mizurov would later turn professional in 1999 with Collstrop–De Federale Verzekeringen, and he reunited with Vinokourov in 2007 at Astana. Vinokourov came second in a stage of the Tour of Auvergne two weeks after he arrived in Europe, and was best climber in a Coupe de France race a week later. Then, during a trial for the Casino professional team at the Tour of Saône et Loire, he won three of the four stages. In total, Vinokourov would win ten races for his amateur club, leading Vincent Lavenu to offer him a two-year professional contract to ride for Casino in 1998–1999. In 2000, Vinokourov joined Team Telekom. He won the combination competition in Paris–Nice and finished third in the Critérium International. He came 15th in the Tour de France after working for captain Jan Ullrich. His first win for the German team was stage 18 in the Vuelta a España, in which he caught the two riders in the breakaway and sprinted past Roberto Laiseka and Vicente Garcia Acosta in the last 300 metres. He came second several weeks later in the Olympic Games behind Ullrich and in front of another Telekom teammate, Andreas Kloden. Vinokourov time-trialed to a stage win in the 2001 Deutschland Tour and took the yellow jersey from his Telekom teammate Erik Zabel. The dominance of the Telekom team was evident the following day when Rolf Aldag won and Vinokourov gained a minute and a half over the peloton to ensure victory. He rode the Tour de France that year in support of Ullrich, where he finished 16th overall. Vinokourov won Paris–Nice in 2002, taking the leader's jersey after attacking Laurent Jalabert and Andrei Kivilev on Mont Faron. The penultimate stage to the Col d'Eze, a mountaintop finish, Vinokourov kept his lead and won Paris–Nice the following day. Later in 2002, he won the first mountain stage in the Tour de Suisse but several stages later he fell on a mountain descent and was taken to hospital after the stage. Vino abandoned the race to prepare for the Tour but it was discovered two weeks later that he had a broken coccyx and could not ride the 2002 Tour de France. Vinokourov races 2004 Worlds TT. Most of all, [it's a victory for] for Andrei Kivilev. He wanted to win on Mont Faron and also Paris–Nice. I really gave everything for this victory, and today was a coup double, for him and for his family. I found the strength to continue the race, only for him, for his family, for his little boy. I'm satisfied today for myself and for them. I'm going to do everything to keep the jersey, and for that I found a double strength, myself and his strength as well. It's fantastic, and I'm very happy. For sure it's a victory for him, and I hope to keep the jersey until Nice. Two days later, Vinokourov won Paris–Nice and in a final gesture to his friend, he displayed a photograph of Kivilev on the podium. Forty days later, after the traditional period for mourning in Kazakhstan, Vinokourov won the Amstel Gold Race. He had reached the leading group with 10 kilometres to go, and attacked them at the 5 km banner. Vinokourov built an advantage of 15 seconds that he fought to maintain up the steep Cauberg finishing climb, winning by four seconds ahead of Michael Boogerd. Vinokourov attacked on the flat first stage of the 2003 Tour de Suisse and only the Russian, Serguei Ivanov, could match him. Vinokourov won the stage and took the lead. Francesco Casagrande dropped Vinokourov on the first mountain stage and closed the gap to six seconds. Casagrande attacked again on the following mountain stage and took the jersey. But Casagrande cracked several days later in an individual time trial as Vinokourov finished fifth to retake the jersey and win the race. Vinokourov was for the first time riding to win in the 2003 Tour de France. He was to share this role in his team with the Colombian, Santiago Botero. Vinokourov finished second on the stage to the l'Alpe d'Huez. He attacked the following day on the final climb 9 km from the finish and won the stage. He moved into second overall 21 seconds short of Lance Armstrong. Several days later in the individual time trial, won by Ullrich, Vinokourov took third position and kept it to the end. He was voted the most combative rider. Vinokourov missed the break on the second stage of the 2004 Paris–Nice that gained five minutes. but he won three stages. He attacked towards the end of a small climb on the fifth stage with 8 km to go. He built ten seconds and won by four seconds. He dedicated the win to Kivilev. Vinokourov attacked the lead group on the flat windy coastal road in the finale of stage 7,with 5 km to go. He caught and passed Samuel Sánchez with 2 km to go and won the stage. Vinokourov won the final stage in a breakaway sprint against Denis Menchov . Vinokourov came third in Liège–Bastogne–Liège, behind Davide Rebellin and Michael Boogerd. Boogerd and Vinokourov had been matching each other while Rebellin waited for the sprint and won. Vinokourov crashed on the second stage of the Tour de Suisse, tearing ligaments in his shoulder. That stopped his riding the 2004 Tour de France. He returned for the Regio Tour at the start of August. In the second stage, he won the time trial. In the following stage, he won the bunch sprint and took the leader's jersey to win. He then rode the Vuelta a España but due to food poisoning lost time during the first week. Vinokourov recovered and finished fourth in the time trial. He rode the world championship and took the bronze medal in the time trial. Vinokourov's first win in 2005 and the first for the team was Liège–Bastogne–Liège. He broke away with Jens Voigt with more than 50 km to go. Vinokourov attacked on the final short climb 6 km from the finish but could not get away from Voigt. Instead he waited and beat Voigt in the sprint. In the Dauphiné Libéré, Vinokourov won the stage on Mont Ventoux. He had attacked the favourites for the Tour de France, reaching the breakaway before attacking at several hundred metres on the uphill finish to win the stage. Vinokourov travelled back to Kazakhstan to win the national championship ahead of Mizourov and Kashechkin. Vinokourov at the 2005 Tour de France sign-in, in Pforzheim. Vinokourov said in July 2005 that he was in as good condition as 2003, when he came third. Vinokourov said he was riding "for the team". The implication was that he would be leader if he or Andreas Klöden (second in 2004) rode better than Ullrich. Vinokourov came third in the opening time trial, beating Ullrich and Klöden by 15 seconds and 1:08. The American, Lance Armstrong, followed Vinokourov's attacks on stage 8 but let Klöden go. Vinokourov rode separately from his teammates, bringing speculation regarding Ullrich's role in the team. Vinokourov lost time in the mountains. Revenge came when he won stage 11 in a break, outsprinting Santiago Botero. Tension between Vinokourov and his team boiled on stage 14 into the Pyrenees where Vinokourov was dropped. He chased for 20 km and then attacked, but Kloden and Ullrich reeled him in, bringing criticism of T-Mobile's tactics which were apparently just to support Ullrich. Vinokourov settled his differences when he won stage 21 to Paris. After 3rd place in the time trial in the penultimate stage, losing time to only Armstrong and Ullrich, Vinokourov moved to 6th, trailing Levi Leipheimer in 5th by two seconds. The final stage, usually a formality, became a showdown between Vinokourov and Leipheimer. A sprint prime with time bonuses came at 75 km in Châteny-Malabry. Leipheimer and his Gerolsteiner team came to the front. Leipheimer needed to prevent Vinokourov from getting it. Gerolsteiner set a fast tempo to discourage Vinokourov. But 1.5 km from the sprint, Vinokourov attacked. Soon only Leipheimer could hold his wheel, but he was not able to pass and so Vinokourov gained six seconds, Leipheimer four. Leipheimer was ahead only by a fraction of a second. When they reached Paris officials stopped the clock due to dangerous conditions (the cobblestone road was wet and slippery from rain), and the final sprint prime was cancelled. Leipheimer said he was informed that normal bonus time for 1st, 2nd and 3rd place on the stage would also not be awarded. He and others thought Leipheimer had 5th place. In the final kilometers, several riders broke clear but were caught. Then, as the pace was increasing, Vinokourov moved to the front. With 2 km remaining, Laurent Brochard attacked and Vinokourov jumped on his wheel. A few seconds later Brad McGee closed the gap. When Brochard cracked, McGee moved to the front, but Vinokourov followed. They achieved a gap that could not be closed. McGee zigged and zagged, making Vinokourov work, but Vinokourov found enough power to pull around McGee and win. That was victory made of courage and guts – I really gave it all in the last kilometres, although I didn't think it was possible until I crossed the line. I just went 'à bloc' – it's unbelievable, magnificent! I have no words for it...I did think a lot about Kivilev yesterday in St. Etienne, and I think that motivated me even more. I'm very happy to win. Tour officials awarded time bonuses after all, so Vinokourov gained 20 seconds to put him into 5th place. As his contract with T-Mobile was up in 2005, many speculated which team he would join, and whether it would give him full support in 2006. The team turned out to be Manolo Saiz's Liberty Seguros–Würth team. Liberty Seguros withdrew sponsorship on 25 May 2006 after the arrest of Manolo Saiz relating to blood doping. A coalition of companies from Kazakhstan took over sponsorship, now called Astana–Würth. On 30 June 2006, Astana-Würth withdrew from the 2006 Tour de France after five riders were implicated in the Operación Puerto doping case, leaving Vinokourov, one of the favorites, with three teammates, below the required six riders. Vinokourov was never accused or implicated. In the Vuelta a España, the team was known simply as Astana after Würth departed sponsorship. After losing time in the first mountains, Vinokourov went into attack. He lost the 7th stage to Alejandro Valverde, took revenge by winning the 8th and 9th stages and climbed to 5th place at the end of the first week. After a good time trial, and aggressive climbing on stages 17 & 18 (stage 18 was won by Kashechkin), Vinokourov took first place and claimed the gold jersey from Valverde. After a strong time trial, his 3rd stage victory, Vinokourov won the Vuelta. I had a hard time putting it back on, but the time I lost only counted for second or third place, so it wasn't that important. Now, I'll concentrate on the road race, for which I'm really motivated. Vinokourov started the 2007 Tour de France as a definite "Yellow jersey favourite," with a new team backed by the same Kazakh sponsors who had taken over Liberty Seguros in 2006 – Astana. The Tour started well when he placed 7th in the London prologue, losing only 30 seconds to time-trial specialist Fabian Cancellara. He was ranked inside the top-10 through the second stage, and he remained in contention for the overall until the fifth stage, when he experienced a misfortune. As the peloton accelerated before the final climb, Vinokourov fell heavily at high speed and tumbled into a ditch with 25k to go. He suffered severe cuts and abrasions to both knees and elbows, and serious bruising to his right buttock. The wounded Kazakh could be seen standing on the left side of the road, gesticulating while a frantic teammate struggled to fix his leader's damaged bike. The main field did not slow to allow Vinokourov to reintegrate with the bunch, but instead raced on towards the finish in Autun. He remounted and began to chase, calling back seven of his eight teammates to help his bid to regain the leaders. The Astana train pursued the favorites, until Vinokourov himself surged ahead of his companions and lead the last wave of the chase. When he crossed the line, he finished 1–20 behind his main rivals, all of whom arrived together. After the dramatic crash and the serious injuries, he lost time in the Alps and was dismissed from the list of GC contenders. I am happy with my performance, I am finding my legs again. Now I want to attack in the Pyrénées. I want to thank everyone in and around the team that encouraged me to get through the Alps. He also won stage 15, a mountain stage finishing in Loudenvielle. The next day (24 July) Vinokourov failed a doping control following his time trial victory. His blood had a double population of erythrocytes, which implied a homologous transfusion. He delivered a positive for blood doping on 24 July 2007. Vinokourov's B sample came back positive a few days later, and Cadel Evans was declared winner of stage 13. Vinokourov was stripped of his stage 15 victory, which was awarded to Kim Kirchen of Luxembourg. According to Phil Liggett, long-time commentator for the Tour, "It is incomprehensible that Vinokourov could do such a thing when he must have known he was under suspicion because of his dealing with disgraced doctor Michele Ferrari in Italy. He must have known he would be tested at every opportunity, and the time trial was the perfect occasion." Vinokourov received a one-year suspension from the Kazakhstan Cycling Federation The UCI was angered by the short ban—a lighter sentence than those received by other cyclists found guilty, such as Tyler Hamilton and Ivan Basso—which would allow him to ride in the 2008 Beijing Olympics. His team Astana then threatened to sue Vinokourov for damages, as did Cadel Evans and team Predictor–Lotto, due to the publicity they lost for Evans not being named the winner at the time of the stage. In December 2007, Vinokourov announced his retirement. Vinokourov in 2011 Tour de Romandie prologue. I love cycling. I want to come back because I didn't want to end my career in this way. I feel as if I can win once again the big races. The UCI then renewed an appeal to the Court of Arbitration for Sport, asking it to overturn the one-year suspension by the Kazakh federation and to impose a standard two-year ban. This appeal, originally filed in 2007, was dropped when Vinokourov said he was retiring. The case was retabled and the CAS ruled the ban would expire on 24 July 2009. Vinokourov made his comeback in Tour de l'Ain in August 2009, riding for Kazakhstan. In the third stage, a time trial over 8.6 km, he won his first race after his ban. Vinokourov re-joined Astana on 24 August 2009 and was named for the 2009 Vuelta a España. It's a great satisfaction. By winning the first stage against the clock I didn't think I would keep the jersey until the end. I even thought not to ride this last stage because I would have driven to Liege if there was no plane. Fortunately, the volcano in Iceland has subsided. I have a flight tonight from Bergamo to Belgium. It [the fact that he wouldn't have to drive] especially helped me to defend my jersey until the final. Riccó is very strong and I feared him a lot with a uphill finish like today. He arrived second and I went fourth just 12 seconds behind, which means that my legs were not bad either. Vinokourov leads the break in 2012 Olympics RR. I do not talk about winning [the Giro d'Italia], but I would certainly [aim to] wear the pink jersey for one day. That would be nice for my collection. With Contador's help, Vinokourov won the 2010 Liège–Bastogne–Liège, six seconds clear of breakaway companion Alexandr Kolobnev with Spain's Alejandro Valverde coming in third, more than a minute after the pair. In December 2011, Swiss magazine L'Illustre ran a story about how Vinokourov had allegedly bought the victory. It was revealed that Kolobnev (who was not on the same team) received a payment of 100,000 Euros after the race from a bank account owned by the Kazakh in Monaco to Kolobnev's bank account in Locarno. The magazine published the e-mail exchange between the two, which started the day after the race. In these, Kolobnev wonders if he had done the right thing by letting him win and shares a copy of his bank info, expressing concerns that they may get caught. Vinokourov replied: "You have done everything properly, do not worry. As you say, the Earth is round and God sees everything [...] Do not worry about the agreement, I will do it." Vinokourov did not deny a payment was made, but said that he did not buy the race: "It's another story to blacken my name. I often loan money left and right." In 2015 investigators in Liege recommended that Vinokourov be tried for bribery. A trial date was initially fixed for March 2017, but has been postponed and is slated to begin in May 2018. It has always been the plan that I'd work for Alberto at the Tour and for myself at the Giro. Barely a month later at the Giro d'Italia, Vinokourov finished 6th overall after having worn the pink jersey as leader of the general classification for five dramatic stages. I was riding the last ten kilometres without thinking of taking the pink jersey. I had seen that Andre Greipel was up there, so I was convinced that he'd win the stage and take the pink jersey with the time bonus. But he didn't win, so the jersey is mine. To get it is wonderful. I received it without looking for it, really. This is my first participation to the Giro d'Italia and I already have the jersey. I showed I worked hard in these two years. In the 9th stage of the Tour de France 2011 Vinokourov fell and broke his right femur. On 17 July 2011, his "retirement" from professional cycling was announced, unofficially and without comment, on Twitter pages by fellow cyclists. Later that day he confirmed his retirement. Rehabilitating from the accident he discovered he felt better than he had anticipated, and decided to ride the 2011 Giro di Lombardia before retiring. In September, he decided to postpone his retirement altogether, and announced he would return for the 2012 season and ride for Astana in the Tour de France. Vinokourov riding the Time Trial at the 2012 Olympics in London. True to his word, Vinokourov returned to pro cycling in 2012 as a rider and debuted at the Tour de Langkawi with his Astana teammates, the same place that Vinokourov started his pro career with Casino with his 1997 performance with the Kazakhstan national team. This is my first big race since I crashed at the Tour de France last year and it will be a good start for my season, for me to find my rhythm before heading to Europe for the Classics. While he had a quiet spring season of racing, barring accident, illness, or another doping scandal, Vinokourov's spot on Astana's Tour de France 2012 roster was secure owing to his status within the team and the symbolic importance for Kazakhstan of his participation. And while he did not win a stage, Vinokourov featured in several breakaways, including an attack on Stage 18 that saw him win the Combativity award for the day. It's just unbelievable. I finished the Tour de France a little tired, but the Olympics, I must go there." About the breakaway group, he continued, "It was up-down, up-down, too many people. It was very dangerous. I knew that if I was following the group I would have had no chance in the sprint. I finish my career with this victory." It is nice to finish off my career with a gold medal. I will still race in the time trial on Wednesday, but I will just spin. I have what I have wanted. I have the gold medal and I can envision my retirement. After his win, he released a statement saying that he may "continue in select events in 2012". I just won an Olympic title. It was a dream, so I cannot be sad. This is the last important race of my career, but I might race some other races at the end of this season as an Olympic champion. On 16 September 2012, Vinokourov auctioned his Olympic gold-winning Specialized bicycle. It was sold to the Tak Group Company for $243,000. The starting price amounted to $50,000. Vinokourov donated the money from the auction for treatment of five children with serious diseases. The bicycle brought good luck to me and I can now support the young citizens of Kazakhstan who are having a difficult time by selling this bicycle. I hope that some of them will become champions, not necessarily in sport, but in their own lives. They should be strong in spirit and fight to the end! And this way they will win," Vinokourov said at the closure of the auction. In the autumn of 2012, Alexander Vinokourov entered L.N. Gumilyov Eurasian National University to work towards a master's degree in Physical Education. Two months later the Union Cycliste Internationale initiated an investigation of Alexandre Vinokourov and Russia's Alexandr Kolobnev over allegations brought by the Swiss news magazine L'lllustre and Italian newspaper Corriere della Sera. They accused Vinokourov of cutting a deal with Alexandr Kolobnev in 2010 to aid him in winning Liège–Bastogne–Liège. They alleged 150 thousand euros exchanged hands. The UCI's investigation is still pending. In August 2014 prosecutors in Liège confirmed that Vinokourov and Kolobnev had been charged with corruption for the alleged deal, with possible penalties including a jail term of between six and 36 months and a fine of between 600 and 300,000 euros. Vinokourov was awarded the rank of honorary colonel in the Kazakh army in 2000, after he finished second to his then-Telekom teammate Jan Ullrich in the men's Olympic road race in Sydney. He was again recognized by the state for his sporting prowess in 2003 after finishing third overall in the Tour and received a medal as People's Hero First Class. In late-2011 Vino was named as a candidate for parliamentary elections in Kazakhstan despite still being active as a professional cyclist. Alexander Vinokourov opened his own bicycle shop on 5 May 2012 in Almaty. ^ a b "Vino's Parents Recall His Childhood". astanafans.com. Retrieved 27 November 2011. ^ Pretot, Julien. "Vino spoils British road race party". Chicago Tribune. Retrieved 30 July 2012. ^ "Lavenu: "On est le Auxerre du cyclisme"". France 2. Archived from the original on 5 December 2006. Retrieved 27 July 2007. ^ "Alexander the great". Daily Peloton. Archived from the original on 27 September 2007. Retrieved 28 July 2007. ^ a b "In Vino Vertas". cyclingnews.com. Retrieved 28 July 2007. ^ a b c d "Échappée n°5 . Été 1997 Rencontre avec Alexandre Vinokourov et Andrei Kivilev par Marie Line GONLON". Espoir cycliste St Etienne Loire. Retrieved 27 July 2007. ^ "Palmarès du Regio-Tour International". velo-club.net. Archived from the original on 27 September 2007. Retrieved 27 July 2007. 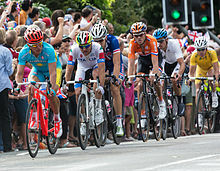 ^ "Men's Olympic road race". cyclingnews.com. Retrieved 28 July 2007. ^ Callahan, Ron (21 December 2011). "Astana to ride Tour de Langkawi". Bike World News. Archived from the original on 18 January 2013. Retrieved 30 July 2012. ^ "Interview de Jean Niger, directeur d'organisation de l'Essor Breton". velo101.com. Retrieved 27 July 2007. ^ "2002 Paris–Nice winner biography". Cyclingnews. Retrieved 9 June 2007. ^ "51st Critérium du Dauphiné Libéré". Cyclingnews. Retrieved 5 April 2007. ^ "Complete live report, Stage 18 Veulta". Cyclingnews. Retrieved 5 April 2007. ^ "2000 Men's Olympic Road Race results and report". Cyclingnews. Retrieved 9 June 2007. ^ "2001 Tour of Germany stage 7 results and report". Cyclingnews. Retrieved 9 June 2007. ^ "2002 Paris–Nice Stage 4 results and report". Cyclingnews. Retrieved 9 June 2007. ^ "2002 Tour de Suisse stage 3 results and report". Cyclingnews. Retrieved 9 June 2007. ^ "Vinokourov unsure about continuing Tour de Suisse". Cyclingnews. Retrieved 9 June 2007. ^ "Vinokourov out of Telekom's Tour team". Cyclingnews. Retrieved 9 June 2007. ^ "Cyclingnews flash Kivilev dies of injuries". Cyclingnews. Retrieved 9 June 2007. ^ "Cyclingnews Vinokourov more motivated than ever". Cyclingnews. Retrieved 9 June 2007. ^ "Emotional Vinokourov does it for Kivilev". Cyclingnews. Retrieved 27 November 2011. ^ "Amstel Gold Race 2003 report and results". Cyclingnews. Retrieved 9 June 2007. ^ "Tour de Suisse 2003 stage 1 report and results". Cyclingnews. Retrieved 9 June 2007. ^ "Tour de Suisse Stage 9 report and results". Cyclingnews. Retrieved 9 June 2007. ^ "Tour de France Stage 20 report and results". Cyclingnews. Retrieved 9 June 2007. ^ "2004 Paris Nice Stage 2 report and results". Cyclingnews. Retrieved 17 June 2007. ^ "2004 Paris Nice Stage 5 report and results". Cyclingnews. Retrieved 17 June 2007. ^ "2004 Paris Nice Stage 7 report and results". Cyclingnews. Retrieved 17 June 2007. ^ "2004 Paris Nice Stage 8 report and results". Cyclingnews. Retrieved 17 June 2007. ^ "2004 Liege Bastogne Liege report and results". Cyclingnews. Retrieved 17 June 2007. ^ "2004 Tour de Suisse Stage 2 report and results". Cyclingnews. Retrieved 17 June 2007. ^ "Cycling news June 15". Cyclingnews. Retrieved 17 June 2007. ^ "Regio Tour Stage 5 results, report and photos". Cyclingnews. Retrieved 17 June 2007. ^ "Cycling news September 9th". Cyclingnews. Retrieved 17 June 2007. ^ "Vuelta a España 2004 Stage 15 results, report and photos". Cyclingnews. Retrieved 17 June 2007. ^ "2004 UCI World Time Trial Championships time trial". Cyclingnews. Retrieved 17 June 2007. ^ "2005 Liege Bastogne Liege". Cyclingnews. Retrieved 17 June 2007. ^ "2005 Criterium de Dauphine Libere stage 4 results, report and photos". Cyclingnews. Retrieved 17 June 2007. ^ "2005 Kazakhstan National Road Race Championships". Cyclingnews. Retrieved 17 June 2007. ^ "June 28th interview with Alexandre Vinokourov". cyclingnews.com. Retrieved 27 July 2007. ^ "2005 Tour de France Stage 11, Courchevel-Briançon". Cyclingnews.com. Retrieved 27 July 2007. ^ "Levi Leipheimer describes how Vinokourov knocked him out of 5th place in the final stage of the 2005 Tour". cyclingnews.com. Retrieved 27 July 2007. ^ Kröner, Hedwig (21 September 2006). "Fabian, the superman World's TT turns out a CSC festival". Cyclingnews.com. Retrieved 1 August 2012. ^ "Vinokourov and Klöden crash". AFP. 12 July 2007. ^ Brallier, Max (13 July 2007). "Top Tour de France Rider Hurt in Crash". Newser.com. Retrieved 1 August 2012. ^ a b c Farrand, Stephen (12 July 2007). "VINO'S TOUR CHANCES IN DOUBT AFTER CRASH". Cycling Weekly. ^ AFP (12 July 2007). "Vinokourov and Klöden crash". BikeRadar.com. Retrieved 1 August 2012. Astana's team leader Vinokourov got back on his bike to rejoin the peloton after crashing inside the last 30km...the Kazakh rider came down on the tarmac while racing at speed. ^ "A mighty maillot jaune holds – Vino returns with stage win". Cyclingnews.com. ^ "Alexandre Vinokourov contrôlé positif, Astana Cycling Team se retire du Tour de France". Team Astana. Archived from the original on 10 July 2007. ^ "Team says Vinokourov fails dope test". Reuters. 24 July 2007. Retrieved 24 July 2007. ^ "Vinokourov positive for transfusion, Astana quits Tour". Cyclingnews. 25 July 2007. ^ "Versus Daily Reports, The 94th Tour de France, from July 7th to 29th 2007". Versus. ^ "Banned Vinokourov quits cycling". BBC Sport. 7 December 2007. Archived from the original on 24 April 2009. Retrieved 7 December 2007. ^ "CAS preliminary decision". Tas-cas.org. Archived from the original on 28 September 2011. Retrieved 2 August 2012. ^ "Alexandre Vinokourov claims first victory on Tour de l'Ain after return from doping ban". Telegraph. 12 August 2009. Retrieved 20 August 2009. ^ "Vinokourov To Head To The Tour Of Spain With Astana". Cyclingnews.com. Retrieved 2 August 2012. ^ "Vinokourov wants pink in Giro d'Italia, hopes to ride Tour de France". VeloNation Press. 21 April 2010. Retrieved 1 August 2012. Yesterday's Giro del Trentino opening time trial saw Astana's Alexandre Vinokourov notch up his third win since returning from his two-year doping ban. ^ "Giro del Trentino: Vinokourov secures overall, Pozzovivo the stage". VeloNation Press. 23 April 2010. Retrieved 1 August 2012. Alexandre Vinokourov (Astana) successfully defended his overall lead in the Giro de Trentino today. ^ "Giro del Trentino: Vinokourov secures overall, Pozzovivo the stage". VeloNation Press. 23 April 2010. Retrieved 1 August 2012. ^ "Vinokourov wants pink in Giro d'Italia, hopes to ride Tour de France". VeloNation Press. 21 April 2010. Retrieved 1 August 2012. With his win yesterday, he is in with a chance to grab the Giro d'Italia's leader's jersey at the opening 8.5 kilometer time trial in Amsterdam, The Netherlands. ^ "Astana's Alexander Vinokourov wins in Liege". BBC Sport. BBC. 25 April 2010. Archived from the original on 29 April 2010. Retrieved 26 April 2010. ^ Brecht Decaluwé (27 April 2010). "Vinokourov victorious at La Doyenne". Cycling News. Future Publishing Limited. Retrieved 23 September 2012. ^ "Vinokourov bought 2010 Liege-Bastogne magazine alleges". Cycling Central. SBS 2012. AFP. 7 December 2011. Retrieved 23 September 2012. ^ a b "Magazine alleges Alexander Vinokourov bought 2010 Liège-Bastogne-Liège victory". Velo News. 2012 Competitor Group, Inc. 6 December 2011. Retrieved 23 September 2012. ^ Gregor Brown (7 December 2011). "Vinokourov fights Liege-Bastogne-Liege bribe allegations". Cycling Weekly. IPC Media Sports & Leisure network. Retrieved 23 September 2012. ^ "Emails between Vinokourov and Kolobnev published". Cycling News. Future Publishing Limited. 7 December 2011. Retrieved 23 September 2012. ^ "Vinokourov, Kolobnev to face corruption trial in March". Cyclingnews.com. 19 December 2017. Retrieved 28 March 2018. ^ Quénet, Jean-François (7 May 2010). "Vinokourov seeks overall victory at the Giro". Cyclingnews.com. Retrieved 1 August 2012. Alexandre Vinokourov will start the Giro d'Italia on Saturday with the aim of winning the overall classification but he admits he has no experience at the Italian Grand Tour and didn't reconnoitre the tricky mountain stages that include the Zoncolan, Plan de Corones, the Mortirolo and the Gavia climbs among others. ^ Quénet, Jean-François (10 May 2010). "Vinokourov pretty in pink at first Giro". Cyclingnews.com. Retrieved 1 August 2012. On just his third ever day in the Giro d'Italia, Alexandre Vinokourov (Astana) has taken the leader's jersey from Cadel Evans (BMC). ^ Quénet, Jean-François (10 May 2010). "Vinokourov pretty in pink at first Giro". Cyclingnews.com. Retrieved 1 August 2012. ^ Keaten, Jamey (17 July 2010). "Alexandre Vinokourov wins Tour de France stage after return from doping ban". Associated Press. Archived from the original on 9 January 2016. Retrieved 1 August 2012. Alexandre Vinokourov did his time for doping. Now, he's back to basking in Tour de France glory again. ^ Keaten, Jamey (17 July 2010). "Alexandre Vinokourov wins Tour de France stage after return from doping ban". Associated Press. Archived from the original on 9 January 2016. Retrieved 1 August 2012. ^ "Four riders including Vinokourov abandon tour after mountain crash – News – Tour de France". ITV. Archived from the original on 16 October 2012. Retrieved 2 August 2012. ^ "Starters – Tour de France 2012". Letour.fr. Archived from the original on 1 July 2012. Retrieved 2 August 2012. ^ Barry, Adam. "Alexander Vinokourov to start the new season at the Tour of Langwaki 2012". Bettor.com. Archived from the original on 17 January 2013. Retrieved 30 July 2012. ^ "Cyclingtime interview with Alexandre Vinokourov". Cyclingtime.com. Archived from the original on 2 April 2012. Retrieved 2 August 2012. ^ a b c Stokes, Shane (19 February 2012). "Vinokourov says Astana is targeting overall victory in Tour de Langkawi". Velonation.com. Retrieved 30 July 2012. ^ "Vinokourov says Astana is targeting overall victory". Kazworld.info. 21 February 2012. Retrieved 30 July 2012. ^ "Tour de France: Vinokourov misses out on stage win, gets most aggressive rider award on stage 18". Velonation Press. 20 July 2012. Retrieved 30 July 2012. Vinokourov had to be satisfied with the most aggressive rider award on today's eighteenth stage of the race. ^ "Mark Cavendish's Olympic bid fails as Alexandre Vinokourov wins gold". Archived from the original on 28 July 2012. Retrieved 28 July 2012. ^ Benson, Daniel (28 July 2012). "Vinokourov wins Olympic gold medal". Cyclingnews.com. Archived from the original on 31 July 2012. Retrieved 31 July 2012. ^ a b "Vinokourov of Kazakhstan wins Olympic road race". Archived from the original on 28 July 2012. Retrieved 28 July 2012. ^ "Vinokourov may start future races, would like to become sport director". VeloNews. 1 August 2012. Retrieved 1 August 2012. Olympic road race champion Alexander Vinokourov rode what he had planned to be his final race as a professional on Wednesday in the Olympic time trial and said afterward that he may continue in select events in 2012 and would like to work as a sports director. ^ "Cycling: Vinokourov auctioned his gold-winning bicycle". Tengrinews.kz English. Retrieved 18 September 2012. ^ "Cycling: Alexandre Vinokourov enrolled at prestigious University". Tengrinews.kz English. Retrieved 4 September 2012. ^ "Vinokourov summoned to UCI regarding his Liege-Bastogne-Liege victory". Tengrinews.kz English. Retrieved 6 November 2012. ^ "Alexandre Vinokourov faces up to three years in prison if found guilty of corruption charge". skysports.com. 21 August 2014. Retrieved 12 September 2014. ^ "Vinokourov Back After 2-Year Ban for Doping". New York Times. ^ "Vinokourov named as a candidate for parliamentary elections in Kazakhstan". Velonation. ^ "Vinokourov will open bicycle shop in Almaty". Tengrinews.kz English. Retrieved 27 April 2012. "Arbitration CAS 2008/A/1458 Union Cycliste Internationale (UCI) v. Alexander Vinokourov & Kazakhstan Cycling Federation" (PDF). Archived from the original (PDF) on 9 August 2014. Retrieved 5 August 2014. Wikimedia Commons has media related to Alexander Vinokourov.